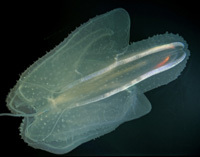 Leucothea multicornis is an oceanic ctenophore seldom seen in the São Sebastião Channel. It has two delicate lobes, subdivided in two independent functional units. Axial tentacles without branches are present in the adult. The outer surface of the body is recovered by several retractile papillae. Specimens reach about 180 mm in length. The species has a wide distribution in tropical and subtropical oceans.